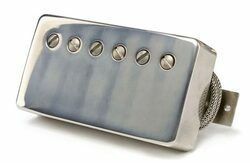 ThroBak Electronics is the world leader in vintage reproduction PAF pickups. 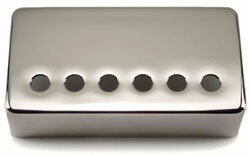 ThroBak PAF clone pickups are copied from original PAF pickups and Gibson patent number pickups from the 50's and 60's. Years of research into every detail of the vintage originals has shown us how make the best PAF style pickup on the planet. ThroBak PAF reproduction pickups are crafted in Grand Rapids Michigan with an unmatched combination of custom made, period accurate parts, and 100% ﻿vintage accurate winding machines and processes.﻿ Made in the USA. Prices start at $562.00 per pair for PAF Repros and $459.00 for Pre-T-Top repros. Free Shipping worldwide and custom made to your specs. Pickups ship within 5 days of payment. ThroBak KZ-115 pickups on The Doug and Pat Show! ThroBak SLE-101 Plus demo by Guitar Player Magazine. Maximum Vintage PAF Reproduction Specs. 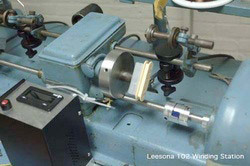 • Patent Applied For clone Butyrate bobbins tooled and molded in the USA to vintage specs..
• Coils wound on vintage Leesona 102 and vintage Gibson, Kalamazoo made Slug 101 Patent Applied For winder assure unsurpassed vintage winding accuracy. • P.A.F. style baseplates tooled and stamped in the USA for ThroBak. • P.A.F. style covers stamped in USA and Nickel plated (with no Copper) at the same Kalamazoo shop that plated vintage PAF covers. • Pole screws with vintage alloys cloned from 50's vintage P.A.F. screw with cold form die tooled for ThroBak. Made in USA. • Entire ThroBak Patent Applied For humbucker assembly tooled and manufactured for ThroBak in the USA. • September 2016 issue of Guitar and Bass Magazine review and award for the ThroBak KZ-115 PAF reproduction pickups. • Music Radar review of ThroBak ER-Custom Pickups in a Collings Electric Guitar. ThroBak Maximum Vintage Series Pickups set the new standard in Vintage tone and manufacturing accuracy. The first successful humbucking pickup was the legendary 50's Gibson humbucker known among collectors as the Patent Applied For pickup or by it's acronym P.A.F.. Surpassing the specifications of the popular ThroBak Vintage Authentic LTD series pickups the MXV series takes the vintage accurate P.A.F. style reproduction to a new level with Maximum Vintage specifications. The MXV series sets a new standard in vintage Patent Applied For (P.A.F.) tone and manufacturing accuracy. Every MXV component has been tooled, molded, stamped and cast for ThroBak to ThroBak specifications and all made the USA. Years of research come together to create MXV parts that very often are made by original vintage suppliers. The result, every part of a MXV pickups is MADE IN THE USA. Details that gave the classic vintage 50's P.A.F. 's their legendary tone are studied and duplicated in the ThroBak MXV Series. Wound on a vintage Leesona 102 coil winder and the vintage Gibson made "Slug 101" winding machine, MXV pickups offers unsurpassed vintage Patent Applied For winding accuracy. Add 42 AWG vintage spec. 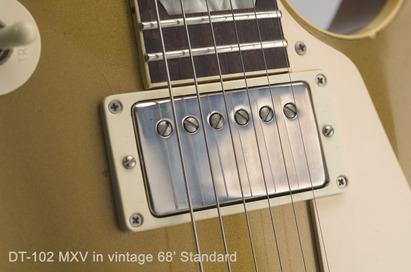 plain enamel wire MXV pickups embody the actual techniques and materials that made the vintage 50's P.A.F. 's great. Custom rough cast USA MADE magnets and a relentless quest for vintage correct parts mean that every ThroBak Maximum Vintage pickup lives up to its name. Vintage Patent Applied For clone Butyrate bobbins come standard on all MXV P.A.F. style pickups. Tooled and molded at a secret location near Kalamazoo. The MXV bobbins represent many, many hours of research and old school tool and die skills. Tooling and molding were fine tuned by hours of on site consultation in order to achieve vintage correct dimensions, materials, construction and cosmetics. Even the distinctive cosmetics flaws in original Patent Applied For bobbins, like the offset square in the circle hole, is duplicated with MXV Butyrate bobbins. Molded with Butyrate supplied by Americas longest manufacturer of CAB these bobbins have the same resonant and mechanical properties as original Patent Applied For bobbins. Color matched from a newly uncovered vintage Zebra 50's P.A.F. assures the plastic color is as close to original vintage specifications as possible. Compare for yourself. Every aspect of production and materials Made in USA. Over the years many myths have grown along with the legend of vintage Patent Applied For pcikups. Perhaps the largest myth is that 50's vintage P.A.F. 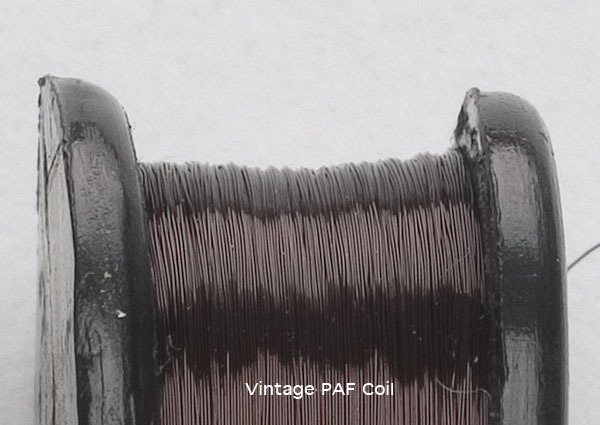 coils or the "best" 50's vintage P.A.F. coils were hand wound. In fact all production vintage P.A.F. coils were machine wound on a very small number of machines. The few machines that wound these coils each put their own tonal signature on the classic Patent Applied For humbucker. A tonal signature that is the result of winding patterns and coil shapes that can only be accurately reproduced by machine. 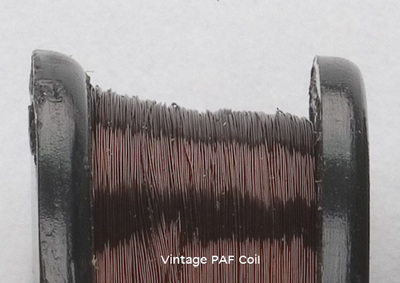 These machines made a wide variety of coil shapes and as a result produced the wide variety tonal colors that we associate with vintage 50's P.A.F.'s. These shapes varied with the machine model and with small differences in operator set-up. 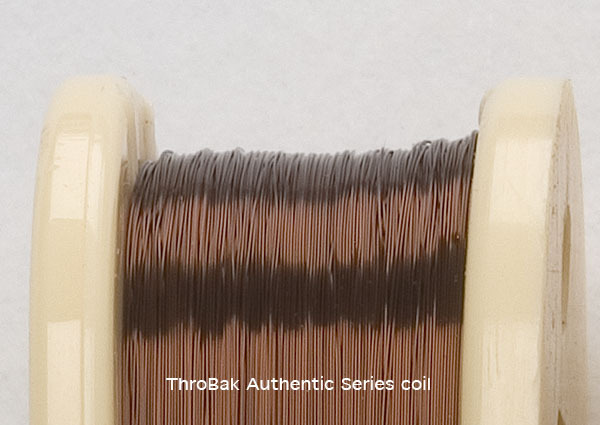 At ThroBak we take all the tonal possibilities that these machines are capable of and combine them to produce the ThroBak Maximum Vintage line of pickups. Above are photos of original Patent Applied For coils and coils made on the vintage ThroBak Leesona 102 and Slug 101 50's vintage P.A.F. pickup winder models. All are very tightly wound solid coils. They are just a small sample of the variety of coil shapes that can be made on these two 50's vintage Patent Applied For winder models. 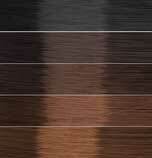 Click the thumbnails and look closely at the variations in winding pattern. The turn per layer count for each machine has not changed but the coil shapes and wire scatter differ radically. Contrary to machine winding critics, coils wound on these vintage machines show a complex wire scatter driven by the quirks unique to these machines. They do not show the orderly distribution of wire exhibited by modern computer controlled winders. None of these winding patterns can be accurately duplicated by hand. Some of these shapes can be approximated by hand winding but the internal wire distribution of the hand wound coil will be radically different from the correct machine wound Patent Applied For coil. Differences that effect the final tone of the assembled Patent Applied For pickup. 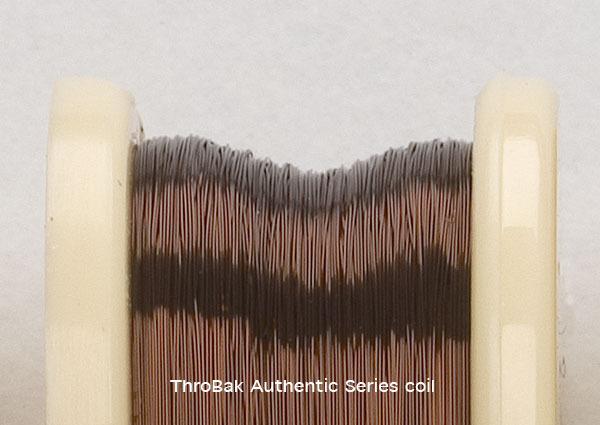 These machine wound coil shapes are in fact the signature winding patterns and tonal signatures of the vintage machines that were put to use in winding vintage Patent Applied For humbuckers. All MXV Series P.A.F. style pickups are wound with Vintage Spec.42 AWG plain enamel wire. MXV series Vintage Spec. plain enamel wire is made in the USA by a small magnet wire manufacturer with a direct lineage as a supplier to Gibson Kalamazoo during the Gibson Golden Era. MXV Vintage Spec. wire is made with the same coating chemistry and processes as vintage era Patent Applied For wire. Even as with vintage plain enamel wire, MXV Vintage Spec. wire has a faint smell of magic markers due to the Benzene used in the coating process. Also MXV Vintage Spec. wire exhibits all of the varieties of tolerances, min. to nom., and build thickness that are found within vintage 42 AWG wire. 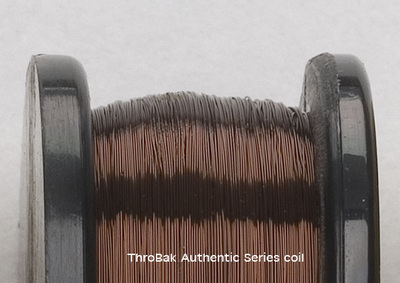 Some makers find this variation in wire within the 42 AWG tolerance an annoyance. But at ThroBak we buy 100lb.-300lb. lots of Vintage Spec. wire and hand sort it with a micrometer to harness this variation as a tonal tool for MXV pickups. Variations in build and diameter that originally created sometimes random tonal results with vintage 50's P.A.F. 's are used to create repeatable vintage tonal magic with ThroBak MXV Patent Applied For pickups. ThroBak MXV magnets are made in the USA with vintage Alnico formulations obtained from vintage magnet analysis and vintage records still on file. ThroBak MXV magnets are custom cast in large lots in several vintage varieties. Long A5 oriented magnets, long unoriented A5, short A5, short A2 and long A2 are some of the vintage choices. 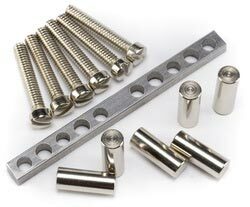 By casting MXV magnets with 3 different USA magnet makers, ThroBak MXV pickups get the same tonal variety within Alnico types as vintage PAF's. All MXV magnets are sand cast. We are constantly searching for and analyzing great sounding vintage magnets so we can deliver as accurate a 50's vintage P.A.F. style magnet as possible. Made in the USA. All metal parts in the MXV Patent Applied For assembly are custom made for ThroBak using the correct vintage alloys. Modern destructive lab testing of vintage parts of the entire vintage 50's P.A.F. assembly assure that the MXV reproduction pole screws, slugs, keeper bar baseplate... are vintage accurate and tonally true to vintage P.A.F.'s. No expense was spared in the quest for vintage accuracy. 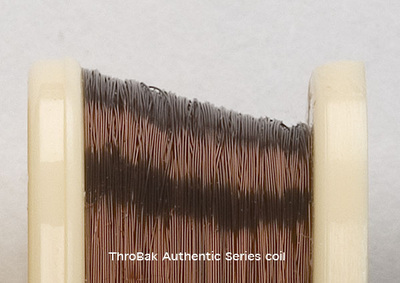 Pole screws are cloned in the USA from vintage samples with with custom cold header forms made exclusively for ThroBak. Slugs are turned on a vintage Brown and Sharpe automatic screw machine to accurately duplicate the bullseye signature look of the vintage original. And keeper bars individually custom machined to vintage specs.. Made in the USA. Custom tooled to ThroBak MXV specifications the vintage 50's P.A.F. 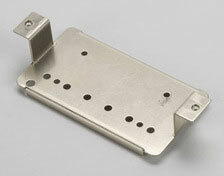 style reproduction baseplates and covers recreate many of the smallest details of the original 50's P.A.F. assembly. Threaded baseplate pole screw holes and flat cover tops with dimpled pole screw holes reproduce the classic look of 50's vintage P.A.F. covers. Correct nickel silver alloys are used as determined by destructive laboratory analysis of vintage P.A.F. parts. MVX Patent Applied For covers are Nickel plated with the correct no copper process at the same family owned Kalamazoo plating shop that did Gibson Nickel plating all the way back to the 50's. Prep buffing and plating are both done in the Kalamazoo area with the same processes that were used with Gibson Golden era covers. As with original 50's P.A.F. covers no copper is used in the nickel plating process assuring as tonally transparent a cover as possible. Correct nickel plating along with ThroBak's 4 step aging process results in realistic aged look with the lightly aged ThroBak MXV covers. Made in USA. Preserve the vintage value of your dead vintage P.A.F., Pat sticker pickup by having it rewound with the machine models used to wind them in the first place. Between the Leesona 102 and the Slug 101 ThroBak can cover any possible winding pattern your vintage Gibson pickup may have. Every effort is made to repair a vintage pickup without rewinding but when when your vintage PAF needs to be rewound do it right. All ThroBak Vintage rewinds are done with NOS 42 AWG plain enamel magnet wire. Care is taken to measure the number of turns and the outside diameter of the original magnet wire. A NOS wire is chosen that matches in size and color as closely as possible to the original pickup. Each rewind receives a certificate of Authenticity stating the machine used for the rewind, magnet wire lot and number of turns for the rewind. Preserve the value and the tone of your vintage pickup with a ThroBak Vintage Authentic rewind. This service is only available to customers with vintage pickups that need repairing. Rewind fee $150.00 per coil. Email us before shipping your vintage pickup.